Oh God–– this book, this series–– five stars is not enough. 10 stars. I just–– I don't even know where to start, other than saying that this is not only one of the best books I've read all year, or my entire life. It's one of the best books ever written. It pulled out every emotion in the end and left me in tatters, but not without hope. Not without saying, "This is writing at its best." Sarah J. Maas is a master of her craft. A gifted writer who continues to draw readers through epic adventures, heart-stopping love and loyalty, and soul-crushing sacrifice. I love the THRONE OF GLASS books, but this one... this one owns my soul. Every beautiful word, every tiny scene captured me, transported me to another realm, and has made me want to be a better writer. I don't know how she did it, but I couldn't be more grateful to have experienced this book. Now, why does it own my life? Well, there's the story. Utterly incredible, detailed and complex, with so many twists and turns that I could scarcely keep track of them all. The best part about it was that everything–– even events from THE ASSASSIN'S BLADE, which should be read to get the full weight of this book–– came into play. The journey that Aelin and her court made was thrilling from the moment it began to the heartbreaking finale. Characters found each other in extreme circumstances and grew in ways I never imagined. The book didn't feel as long as it was, and it kills me to know I have another year to wait for the finale. There were scenarios that left my eyes wide with panic, my heart pounding and desperate to get to the next page, and I had to bite my tongue (reading in public) to stop from cheering on the characters. Aelin... I don't know how she does it. That woman is a genius, an inspiration, and unquestionably a queen worth fighting for. Side characters like Eldie, Manon, and Lorcan surprised me. Dorian is going to have an incredible journey and I can't wait to see what happens to him. Aeidon and Lysandra were amazing and had great inspirations. And Rowan... Oh gods, there are no words for Rowan. Maas certainly knows how to make you fall in love with characters like him. There's a reason her romances threaten to stop my heart whenever I read them. The ending... I can barely talk about the ending. It was brutal and I cringe about the opening of book six, but it was also beautiful. The sacrifice and pain that was endured, what it all forged toward, the gravity of it... You're not human if you don't feel something during those last 100 pages. This is the longest review I've ever written outside of my website, because this has easily become my favourite book of all time. EMPIRE OF STORMS is one of the many books that has now shown me what epic, amazing writing looks like, and I can only dream that one day I'll have honed my own craft to this level of skill. This book is inspiration bound in paper and ink, and I will never stop loving it. War is coming will they be ready? Summary: Aelin Galathynius is about to embark on the toughest part of her journey to rightfully claiming her throne. 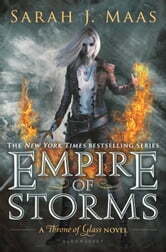 Weak in numbers Aelin sets out calling in all her life debts and promises owed. With Rowan, Aedion, and Lysandra by her side, she will call to the depths of her magic in hopes of stopping all the horrors that keep coming from Morath (Valag, Ilken). Aelin will soon realize she has to search the past to conquer the present and future. War is coming are they ready? What is Aelin ready to sacrifice to keep the ones she loves safe? Characters: Aelin Galathynius, Queen of Terrasen, fire burns through her veins, quick witted, never willing to back down from a fight. Prince Rowan Whitehorn, fae warrior, swore his life and love to Aelin, can shift into a hawk, never backs down for the ones his loves. Lysandra, Lady of Caraverre, shape shifter enjoys being a ghost leopard best of all. Aedion Ashryver, General of the Bane, cousin to Aelin, wolf of the north, speaks his mind Manon Blackbeak, wing leader of the iron teeth, commanders her thirteen and their wyverns. Dorian Havilliard, King of Adarlan, powerful with his ice magic, needs to stand out of Aelin's shadow. Elide Lochan, Lady of Perranth, kept locked up by her uncle, until Manon freed her. Ready to serve Aelin Lorcan Salvaterre, demi-fae warrior, took the blood oath to protect and serve Maeve Quotes: The fear of loss... it can destroy you as much as the loss itself Nameless is my price Final Thoughts: Love the Throne of Glass series book covers. I loved and hated this book at the same time. During the action sequences I was on the edge of my seat. I thought Dorian was unimportant until the end of the book. He seemed weak and afraid standing next to Aelin. Again Chaol was nonexistent three books now not enough Chaol. In the first two books he was the best, the first two book were the best. I found Rowan annoying and very possessive. I loved when Rowan and Aelin wanted to kill each other now I find them boring. Overall the book had some great moments that I loved and enjoyed. I prefer the character of Celaena to Aelin. Ever have the feeling you can’t wait for a book and then that book comes out and you just have to read it right then, even if you’re reading something else? Even if you have something else to do? Yeah, I felt like that with this. Now, I wish I hadn’t. Not because it was bad. No, because it was that good. And the ending. Oh, the ending. Sweet, lord. The ending, without spoiling you, is killer with a capital K. So, that’s why I wish I hadn’t. I wish I’d waited until the next one, which is rumored to be the last in the series, is out and I could have read them back-to-back. Aelin spent the book trying to gather forces together, to build and army but there were so many that didn’t make it easy. I was astonished at how many people even within her own circle of people that were not exactly against her but that gave her trouble, that make her life that much harder when they were supposed to be supporting her. It was like, when things got tough, the nice and shiny wore off and they wanted perfection. Life’s not like that, not even in books. It kind of annoyed me, to say the least. I was really shocked at the turn of events too, with what happened at the end, who ended up at the end of the book, coming back at Aelin. It’s like we almost came full circle in a way. I should have been expecting it but I wasn’t. Shame on me. I’m glad we finally got some insight into the past, what happened back when she was a child, and even before that, generations ago what set everything into motion to get to this point. It’s nice to finally be in the know, to some extent at least. All in all, I really enjoyed it. And it was a blast to see Rolfe again. If you’ve missed out on the origin stories, you really should read them or you won’t get a lot of the references. 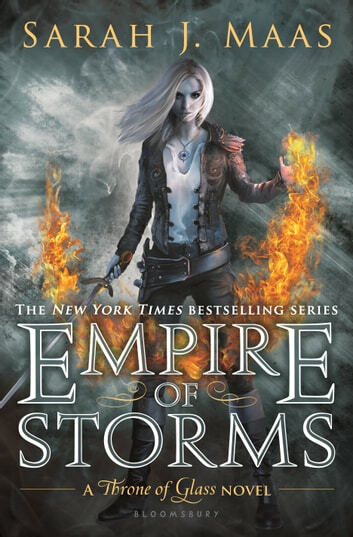 EMPIRE OF STORMS is a must-read for fantasy junkies everywhere! Wow totally through me for a loop, so many surprises. This series is so well written and makes a person read until finished the book. Wish the 6th book was out already. I loved it. The characters battles they each have to fight are true sadness, laughter and cheerful. The main character is great.